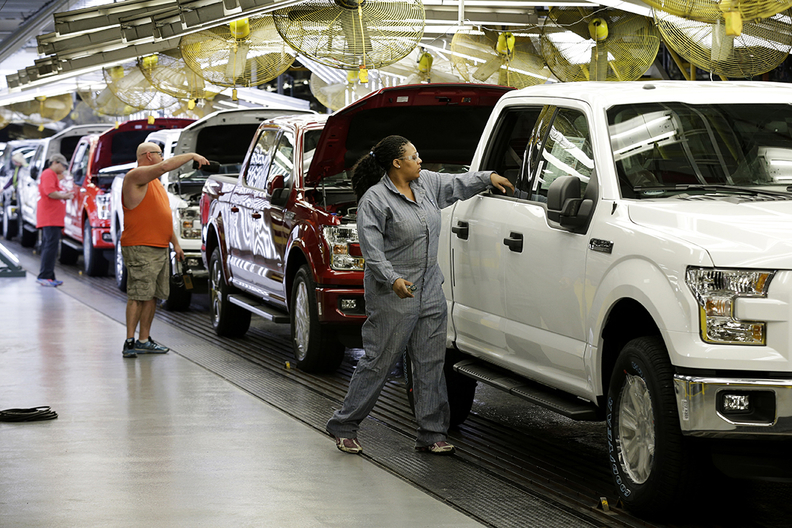 Workers inspect trucks at a Ford plant in Kansas City, Mo. UAW President Dennis Williams says the union is still interested in pooling autoworkers into one large health plan, though work has gone slowly following the controversy generated after the concept was floated during last fall's Detroit 3 contract talks. At a news conference, Williams said there was purchasing leverage to be gained with hospitals and doctors by combining active workers from General Motors, Ford Motor Co. and Fiat Chrysler Automobiles in one large group. The three combined employ about 140,000 UAW-represented autoworkers. But workers in contract negotiations started to spread rumors that the plan would replace the rich healthcare benefits enjoyed by the rank-and-file. That caused Williams and UAW leadership to shelve the plan until after new four-year contracts were negotiated last fall with the carmakers. Under the new contracts, healthcare was mostly untouched, leaving UAW members and their dependents with some of most comprehensive benefits and lowest out-of-pocket costs in industrial America. Longtime UAW-represented autoworkers pay no premiums or deductibles for the coverage they receive from the self-insured plans of the Detroit 3. On average, hourly UAW workers pay for about 6% of their total healthcare costs vs. more than 30% for salaried employees at the Detroit 3. Williams said the union wants to renew conversations with the Detroit 3 on a healthcare co-op when it clears other priorities. Right now, the upcoming national elections are hot on the UAW radar screen. Williams said the union is waiting to endorse either Hillary Clinton or Bernie Sanders for president because the lively debate between the candidates is good for airing important issues on trade, immigration and social responsibilities. He said presumptive Republican nominee Donald Trump had taken himself out of contention for UAW support early in the campaign cycle. He did so by suggesting in a newspaper article that America could keep jobs from moving to Mexico or overseas by reallocating work from more unionized northern states to non-union factories in the South. Williams acknowledged, though, that internal surveying of UAW members showed that Trump had struck a chord with a percentage of the membership by promoting better trade deals and tighter control of U.S. borders. The UAW has been loathe over the years to negotiate copays and deductibles into contracts. The union has reasoned that all Americans deserve top-flight care and UAW members have given up pay increases in contract talks to keep out-of-pocket healthcare costs in check. Williams said the UAW still has concerns about the Detroit 3 facing an excise tax on the rich benefit plans offered autoworkers under provisions of the Affordable Care Act. Enforcement, though, of the Cadillac tax has been pushed out two years from 2018 to 2020. It is not known what that tax would cost the Detroit 3, but the law imposes a 40% tax on worker healthcare benefits exceeding $10,200 for individual coverage and $27,500 for family coverage. Fiat-Chrysler's current average annual healthcare cost for a longtime hourly employee is $18,000 and somewhat less for entry-level workers. Ford's blended annual healthcare cost per bargaining-unit employee is $15,000, the company said. Williams said the UAW has not asked the presidential candidate where they stand on continuing the Cadillac tax. Leading up to the contract talks that resulted in new four-year contracts last fall, the Detroit 3 declared controlling healthcare costs one of their top issues. Healthcare cost inflation combined with additional employees has pushed Ford's estimated healthcare cost for bargaining-unit employees to $800 million in 2015 from $550 million in 2011, Ford has said. Fiat-Chrysler costs late last year were on pace to hit $615 million vs. $347 million in 2011. Ultimately, though, the carmakers punted on major healthcare reforms during contract negotiations. Instead, they provided raises being demanded by workers and avoided strikes at a time their plants were running at nearly full capacity.